The PTZ-2000-10 is a great choice for indoor or outdoor camera installations where a moving PTZ (Pan-Tilt-Zoom) camera is required. This camera can be controlled with high speed movement, and allows you to zoom right in on the objects around with optical 10x zoom. This camera has continuous 360° movement so you can continue panning this camera around completely. This camera comes with a direct ceiling and wall mount bracket for installation on virtually any ceiling or wall. The built-in electronic 10x optical zoom is ideal for areas where you need greater clarity. These cameras can be plugged into any existing analog DVR and are a great upgrade for systems with cheaper, lower resolution cameras (Lorex, NightOwl, etc). 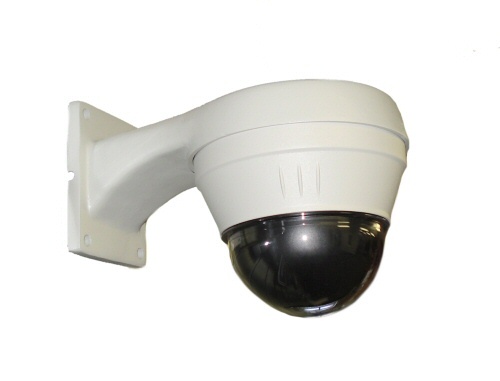 The PTZ-2000-10 PTZ Dome Camera.